The Ibanez 2018 AZ242F Premium Electric Guitar in Tequila Sunrise Gradation boasts superb craftsmanship at an affordable price - with an eye-catching finish for good measure. The AZ242F is perfect for touring professionals who want a consistent axe to perform with, but don't want to go broke in the process. Each model is supplied with a soft case to get you from home to the studio or the stage with ease. The Ibanez 2018 AZ242F Premium is designed to ensure an exceptional comfortable playing experience. The slender body depth is paired with ergonomically designed contours that allow your hands to roam freely. The upper bout tapers off to offer a comfortable resting position for your picking arm, whilst removing any obstacles from your path to sail through performances with abandon. Thanks to the deep double-cutaway profile, the highest frets are within comfortable reach to prevent over-stretching. The body is built using basswood, which produces a well-rounded output that lifts the low-end and tempers the highs for a focused mid-range character. Whatever style of music that you play, the AZ242F has the versatility to seamlessly waltz through anything with the greatest of ease. Paired with the basswood is a sophisticated flamed maple top, which has been finished in a glorious tequila sunrise gradation. The Ibanez 2018 AZ242F is fitted with a pair of Seymour Duncan Hyperion humbuckers, which offer a dynamic output that responds accurately to your playing style. The tonal versatility of the basswood/bocote body is translated sweetly, giving you a wide range of tones to draw from. Control comes in the form of master volume and tone controls, as well as the dyna-MIX9 switching system with alter switch. The body of the Ibanez 2018 AZ242F Premium is equipped with a Gotoh T1502 tremolo bridge, which provides accurate tremolo control whilst optimising intonation and sustain. The headstock is home to Gotoh MAGNUM LOCK machine heads with H.A.P. to uphold tuning integrity with absolute precision throughout the most demanding of performances. 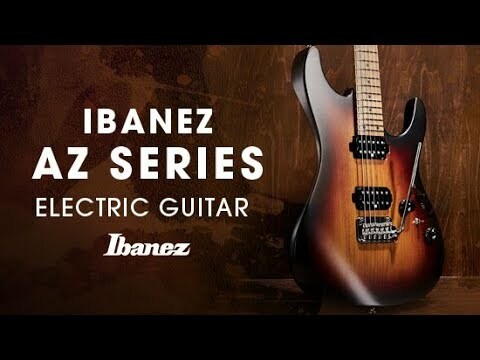 If you're seeking a powerful yet affordable model that can easily hold its own throughout the most demanding of performances, the Ibanez 2018 AZ242F Premium Electric Guitar is ready and waiting for you.